"Winter is coming." Is your home prepped for the upcoming cold weather? 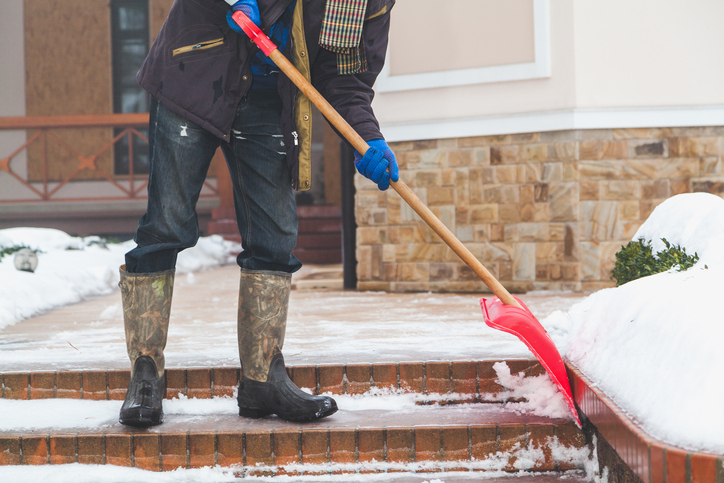 Don't be caught unprepared—use our list to make sure your home is winter ready. Mild weather makes fall the perfect time to get your home ready for the colder months ahead. If you live in an area susceptible to heavy snow and cold temperatures, these winterization steps could save you from expensive damage and keep your energy bill low. Preventive maintenance keeps snow and ice from causing structural damage which, aside from threatening physical collapse, can also promote mold growth and cost a lot more to repair than it would have cost to maintain. By spending some money up front to insulate and seal your home, you could lower your monthly energy bills for years. These tips are especially important if you recently moved into your home—be as thorough as possible in your first year of homeownership and you’ll likely have to do less in the coming years. A smart thermostat lets you preset your thermostat from your smartphone to turn the heat down when you leave for work and back up for your return in the evening. This can save you money on your monthly energy bill, and you won’t have to think about making adjustments every day. The popular Nest thermostat learns your preferences for you, so you have to manually set it only occasionally. It uses geofencing to determine when you’ve left the house and will adjust the temperature in the house to an “eco” mode that uses the least amount of energy based on outside temperatures. The Nest also sends you monthly reports that show how much energy you’ve used and how much money you’ve saved with the smart device. Another of our favorites, the ecobee3, is great for larger homes because it lets you heat or cool specific rooms rather than the whole house. If you have guest rooms that are unused most of the winter, you can save a lot by not pumping heat into them. Keep the thermostat at about 68°F when you’re home during the day. Lower the thermostat by 7 to 10 degrees for eight hours each day. Don’t turn the thermostat way down at night—it’ll require extra work to warm it up again in the morning. Don’t crank up the heat in an attempt to warm it faster—this will just overwork the system, and it will warm at the same rate. On sunny winter days, open your curtains and blinds during daylight hours to let the sun naturally warm up the room (clean windows will let in more warm sunlight than dirty windows). Once the sun starts to set, close the blinds and curtains to help insulate and reduce the heat lost through the glass of the windows. Locking windows also creates a tighter seal, which keeps the warm air in and the cold air out. Make your ceiling fans useful in the winter too. By lowering the fan’s speed and reversing the direction so the blades move clockwise (they move counterclockwise in the summer), you can force downward the warm air that naturally rises to the ceiling. These reverse switches are usually located on the fan base, but with some models you may have to remove a few screws. The air around you will feel warmer, so you can lower the thermostat a couple of degrees and save energy. Turn the unit off to prevent it from running on a warm day, which could bring water into the unit that could freeze later. Clear weeds, plants, or other debris surrounding the unit. Spray the unit down with a hose to remove dirt, dead bugs, leaves, and bird droppings. Let it dry completely. Install foam pipe covers around exterior pipes to protect against freezing. Cover the unit with a waterproof vinyl or plastic cover and secure the cover with ropes or bungee cords so it won’t blow away. Alternatively, you can place plywood over the unit and weigh it down with a brick or rock. Regularly clean snow, ice, and debris off the cover so it doesn’t weaken or leak. Heating systems work most efficiently when the warm air stays in and cold air stays out. Especially with older homes, you’ll want to find anywhere warm air is escaping from and seal it tight. For the outside, check areas where two different materials meet, such as corners, water faucets, chimneys, and foundation. Inside, check for cracks and gaps around doors and window frames as well as electrical, gas, TV, and phone line entrances. Weatherstripping should form a tight seal when the door or window is closed but not inhibit its movement. Consider spending more for more durable materials in high-traffic areas, such as front doors or kitchen windows. You may be able to go with cheaper materials on less-used areas, such as guest room windows. If you already have weatherstripping installed on your doors and windows, now is a good time to check it out and replace where necessary. Once you’re past the point in the year where you’ll want to leave your doors open to let fresh air come through the screens, consider replacing those screen doors with storm doors. Storm doors are typically made of aluminum and strong glass and are designed create a tight seal. This seal will prevent heat from escaping, improving your home’s energy efficiency. If there isn’t an overhang above your door, a storm door will also protect against wind, snow, and rain, helping preserve the life of your decorative door. Proper insulation is one of the most important ways to keep the heat inside your home where it belongs. Gaps and thinning areas of insulation occur naturally over time, so you’ll want to conduct an energy audit every year. If you’ve just moved into your home, it’s worth having a professional conduct the audit and fill in the gaps where needed. After the initial professional assessment, you can check your own insulation each year with a low-cost laser thermometer. Spots where the temperature is significantly lower than their surroundings indicate insufficient insulation. If leaks are around vents, light switches, or outlets, go ahead and caulk them. If floors are the problem, consider adding rugs or installing carpeting. If an interior wall has a significantly lower temperature reading than other interior walls, the insulation may be weakened in that wall. You can use spray foam insulation to fill in those gaps. Attic insulation keeps heat inside the house (lowering energy bills), keeps temperature consistent between rooms, and helps prevent ice dams. Insulation installation can be tricky and dangerous, so we recommend going with a professional on this one. If you choose the DIY route, make sure you wear safety glasses, gloves, a protective mask, and a hard hat at all times. 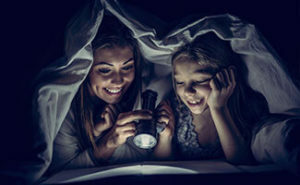 Energy Star provides more extensive step-by-step instructions and safety tips, including guidelines for dealing with vermiculite insulation, which may contain asbestos. 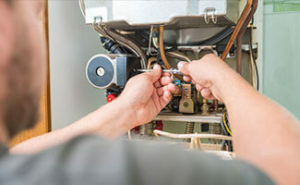 To keep your furnace from failing when you need it most, you should have it serviced at least once a year. These tune-ups keep it running longer and can identify deadly carbon monoxide leaks. A filter change will likely be included in this annual checkup, but you should get in the habit of checking the filters on a monthly basis. Clean filters increase energy efficiency and ensure your heating system is circulating clean air in your home. If the filter is dirty, it’s time to change it. This doesn’t necessarily mean you’ll need to change the filters each month—in many homes, filters can last three or four months. If pets or smokers live in the home, the filters will get dirty faster and will require more frequent changes. Specific installation instructions will depend on the kit you buy, but it essentially involves turning off the heater; cutting the blanket to fit the around the valves, pipes, and burners on the unit; and securing the blanket with electrical tape. Be sure to read safety instructions thoroughly to ensure that important components don’t get blocked and catch fire. Because they’re not occupied by humans, unfinished basements, crawlspaces, and attics typically don’t get heat from your central heating system. This makes any pipes running through these spaces susceptible to heat loss and freezing. Install simple foam pipe insulators to keep them warm and conserve energy. Depending on where you live, you should have at least a decent snow shovel and a de-icer to make your mail carrier’s life easier. If you have a lot of space to cover, get a snowblower and make sure it’s ready to go before the first snow. If you’re unable to take care of the snow yourself (either physically or because you’ll be out of town), hire a regular snow removal service—most cities will fine you if the snow isn’t cleared from your sidewalk within a designated time period. Don’t forget to plan for snow removal if you go out of town for more than a couple of days. A roof rake, which looks more like a squeegee than a rake, helps you remove snow from your roof. Removing heavy snow can help protect against damage to the eaves and prevent ice damming. To avoid accidental damage to your roof in the process, get something like the Garelick roof rake that includes rollers to keep the blade raised above the shingles. Heavy snowfall can cause a buildup of ice on roof edges, called an ice dam. As the snow melts, the dam prevents water from draining properly off the roof, and instead the water builds up against the dam. This water buildup can cause costly internal and external damage to the walls and ceiling of the house, including structural weakening and mildew. Because ice dams are caused by temperature differences between different parts of the roof, the best way to prevent them from forming in the first place is by sealing any leaks in your ceiling so the warm air does not escape into the attic. You can also increase roof insulation to reduce the amount of heat loss. Externally, remove the snow from the roof with a roof rake or broom (but be careful not to damage shingles). You can also create channels in the dam to allow the water to run off from behind the dam. Ice dams tend to be more common with older homes since modern homes are often designed to prevent ice damming on the roof. You should still check with a local contractor to learn more about your home’s risks and the best ways to prevent ice damming. Even a small roof leak can promote mold growth, cause wood rot, destroy insulation, and damage ceilings. In the winter, snow sits on your roof and slowly melts, sometimes for days, giving the water more time to seep through any imperfections in the roof. If leaks are small, you should be able to fix them yourself with caulk or by replacing damaged roof elements. If leaks are more serious, it’s worth it to hire a professional to conduct a full assessment. Once the leaves have fallen and before the first snow, take time to make sure your gutters are in good shape for the winter. They’ll need to be clear of debris, free of leaks, and strong enough to handle snow in order to be effective all season long. 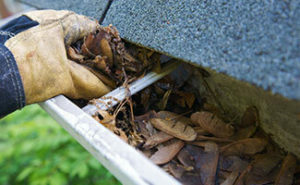 Clear all the leaves, mud, and other debris out of your gutters, including the downspouts. Find and caulk leaks, which left unattended can trap water behind the gutter and rot the fascia boards. Leaks will typically be in the seams, where the old seal has worn out. Check that gutters are properly secured and replace gutter spikes and downspout rivets where needed. A weakly secured gutter can break during heavy snow, costing you more down the road. Adjust downspouts so they direct water at least five feet from the house. This prevents melting snow from saturating the ground immediately around the house, which can damage the foundation. Mark your propane tank with a flag or something else that will be visible under several feet of snow. Keep tank at least 20% full. This will help keep the pressure up and ensure you’ll have enough in case roads are inaccessible. Keep snow and ice off the tank. 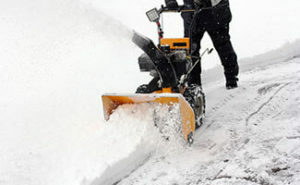 Use a broom or other soft implement to knock snow off the tank and clear the area surrounding it. 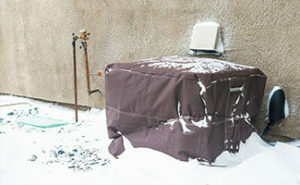 Don’t try to keep snow off using a tarp or other cover—the tank needs to be exposed to direct sunlight whenever possible to keep it warm and the pressure up. Clear snow and ice off the meter, valves, exposed pipes, and regulator vents. Clear snow and ice away from all outdoor vents, flues, and chimneys on your house to prevent CO poisoning. Never use a snowblower near your propane tank. Never try to boost pressure by warming the tank with an open flame or electrical device . Because it’s colorless, odorless, and tasteless, carbon monoxide is pretty much impossible to detect without an electronic CO detector. 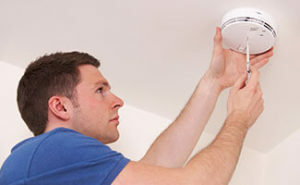 If you haven’t already, install a CO detector on each floor of your house and change the batteries every six months. Risk of carbon monoxide poisoning increases in colder months for a couple of reasons. First, we’re typically using more CO-emitting things to keep us warm, such as portable generators, stoves, lanterns, gas ranges, charcoal, and wood. Whenever using these things inside, make sure the space is properly ventilated so the noxious gasses can escape. Second, snow or other debris can block your ventilation system. When you’re shoveling, clear the areas around outdoor vents to ensure gases can escape the house. 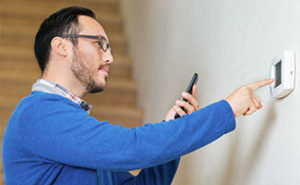 Frontpoint and Vivint, our top two home security systems, both include freeze and flood among their many environmental sensors. With both systems, you can get alerts sent to your phone when there’s a significant change so you can resolve any problems as quickly as possible. These types of sensors are especially important in vacation properties. A chimney should be cleaned after each season—ideally before summer hits, because humidity plus the creosote can damage masonry. However, if the chimney wasn’t swept last spring, make sure it’s done before you use it this winter. A dirty, blocked, damaged, or improperly built chimney can result in CO poisoning, which can be deadly. Make sure your smoke and CO alarms are working. Use a metal guard to keep embers in and children and pets out. Keep combustibles (drapes, furniture, rugs) away from the fireplace when a fire is burning. Clean out ashes regularly. A one-inch layer of ash will help your fire burn hotter, but anything more than that will cause unnecessary wear on the grate. Choose your wood carefully. Hard woods, like ash, maple, and oak, generate more heat than soft woods, like pine, cedar, and poplar. Also, wood that has been cut and dried for six months to a year will burn cleaner and generate less smoke than damper “green” wood. If you don’t take steps to winterize your sprinkler system, you may have costly repairs to make come springtime. First, before outdoor temperatures reach freezing, shut off the water supply to your lawn irrigation system. Insulate the shutoff valve with foam, straw, or some other method of protection. Second, drain water from the pipes. Water left in the system (especially closer to the surface, where the ground gets colder) could cause pipes to crack or burst. There are several different methods for this, and depending on your system, there could be some safety risks involved, so it’s best to consult with a local professional. If your sprinkler system isn’t automatic, drain the water out of your hoses (drape them over a large structure, such as a play structure, shed, or fence), coil, and store. Once you’ve cleared your sprinkler system, turn off the water access and wrap the outside faucets with insulated covers so they don’t ice over. Dead or weak tree branches can pose a physical and financial risk if not taken care of before winter. Strong winds and snow can break susceptible branches, which could fall on your house, your neighbor’s house, or power lines. Focus on branches that hang directly over a structure or power lines, but look for dead or diseased branches as well, as these can still blow into dangerous territory if broken. More power outages happen in cold months due to stress on the power grid and extreme weather conditions, which can break branches that can fall on power lines. Make sure you’re prepared in case the power goes out by stocking up on candles, matches, flashlights, batteries, ready-to-eat food, and plenty of warm blankets. Are we missing anything? What are some other ways you prepare your home for winter?